RPS Ascension: The Autumn Accords (Autumn, Year 1) | SPACE-BIFF! After the long summer campaign and successful conquest of Histyra, Akenbei is so swollen with confidence that he returns with his army to Yomi for a month of feasting and reinforcement. While there, his researching sorcerers inform him that they have completed their first forays into the lost science of Alteration — the school of magic concerned with bending the physical world to the will of the caster. Akenbei immediately decides to forget that he ever bothered with the useless Twist Fate spell, and sets to practicing one of the new Alteration spells being passed around Yomi: Personal Luck. This trick grants him immense fortune in combat, making enemy ankles catch in molehills as they charge, and swords slide uselessly off his rough hide. But while Akenbei is delighting in his new powers, he receives some bad news, both from Rai in the south and the watchposts along the borders of Yomi. Akenbei could not have chosen a more satisfactory enemy to be located on the western landmass of Antopeos. The nation of Marverni is little more than a smattering of allied bare-chested warriors, horsemen, and druids. The druids may be known to be among the most powerful mages in the world, but much of the knowledge of the Old Schools were lost under the rule of the Pantokrator, and would have to be relearned line by line. And once learned, the most potent magics would require significant talent and a great many gems to fuel their casting. Surely, Akenbei reasoned, he could invade the pitiful lands of Marverni and hoist their pretender’s head (or equivalent) on a pike before they uncovered too many of the old mysteries? However, Rai’s reports are distressing. 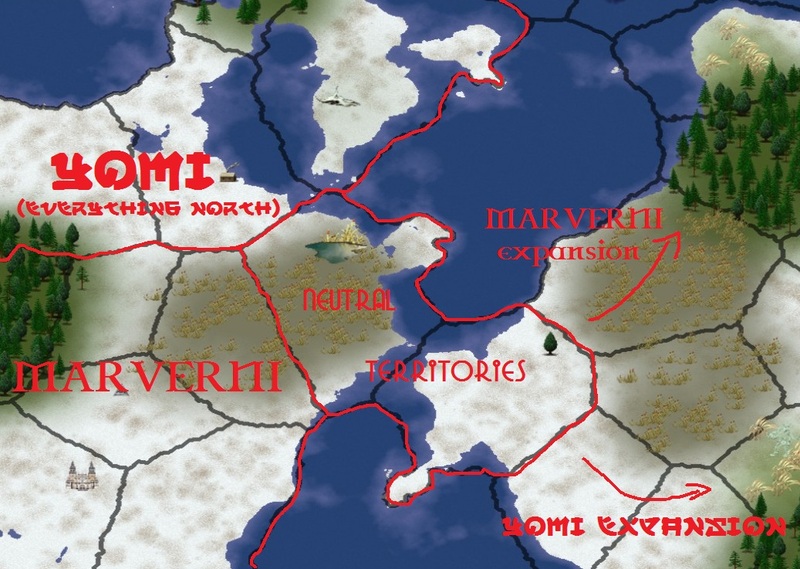 The nobles of the allied Marverni tribes have been progressing apace with Yomi, already having conquered Ardun and Zimmria, and they do not lounge in their capital feasting. 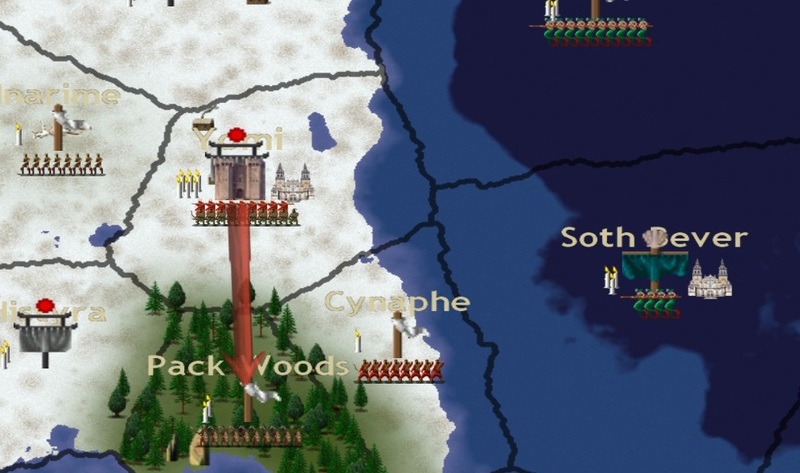 Even worse, the nation of Oceania has appeared very suddenly on the borders of Yomi, and has already made an underhanded attack on Akenbei’s sovereignty by building a temple within praying distance of Yomi itself. 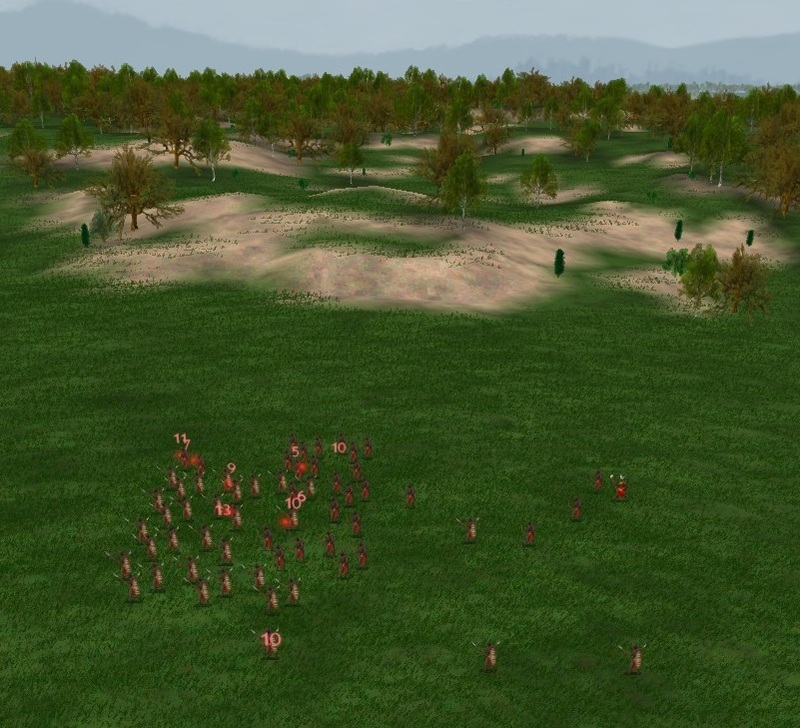 Raidon proposes that their rejuvenated army march south to capture Pack Woods, a rich territory held by the Lion Tribe; and then to immediately veer east to Cynaphe without wasting any time to resupply or pacify resistance. In so doing, they could then construct a series of temples to both strengthen Akenbei’s dominion and to protect from the prayers of the faithful of Nerae, Oceania’s patron. Beyond this immediate campaign, Raidon argues that Oceania will be in no position to crawl out onto Yomi shores without their dominion polluting the land to give them strength, and the army could then continue south to exterminate the Marverni tribes. Akenbei approves of this plan, filled as it is with bonesnapping and bloodshed. Ichiro’s proposal to send emissaries to both Nerae of Oceania and Wayland of Marverni is met with stern disapproval, and instead Ichiro is placed in charge of hiring a priest to build temples along the coast. Pack Woods falls easily, the armies of Yomi engaging in hearty slaughter. 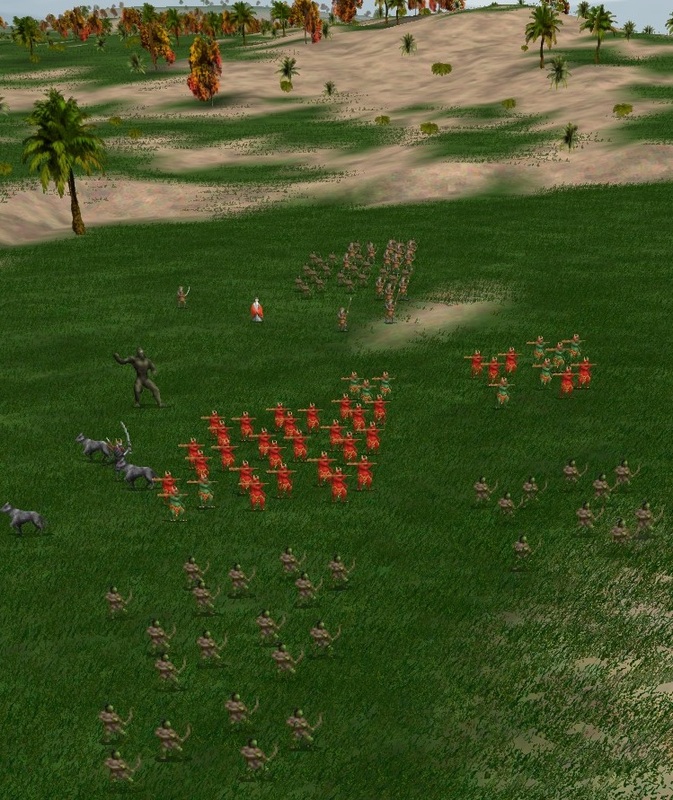 Without pausing to secure the countryside against those loyal to the shamans of the Lion Tribe, the army pushes east to the coastal state of Cynaphe. There, Akenbei and Raidon merge their forces with reinforcements from Yomi under the command of Ichiro and Nanvather the Demon-Priest (in name only; in fact he is only a human who worships demons). The meager defensive militia of Cynaphe routs within seconds after beholding the size of the Yomi army and weathering just two volleys of bakemono arrows. With these two provinces now under Yomi control, plans are formed for the push south. The army has only been camping for a few days when an emissary bearing the flag of parley appears on the horizon. A few of Raidon’s bandits seize the emissary, beat him senseless, and prepare to mince him into bakemono-feed, but Ichiro insists that they at least rifle through the messenger’s pack. There they find a proposal from Wayland himself (at least Akenbei, being male, assumes Wayland a man). The words are sound, speaking of the poor worth of the western portion of Antopeos, and asking that the Yomi and Marverni come to an arrangement that will lead to great and satisfying bloodshed on the main continent. Akenbei is intrigued by these words, as though the patron of Marverni knows the most intimate desires of his heart. The gist is this: Yomi will claim the upper half of Western Antopeos, and Marverni the south. Then they will alternately claim the provinces that make up the land-bridge that leads to the rich heartlands, and there one nation will expand north and the other south. After some discussion, with Ichiro championing the treaty and Raidon opposing it, Akenbei bursts into laughter at his realization. The treaty does not appeal to him half so much as his future betrayal of Wayland, who will march his armies far from home, secure behind the fortress of friendship, only to find bandit raiders already hiding in his lands and a massive demon army marching for his capital! Akenbei has Ichiro compose a missive to Wayland accepting the deal on certain conditions — Yomi will get an extra territory in the south, and once on the mainland the two nations will cross, with Yomi expanding southwards while the Marverni go north. Raidon assures Akenbei that while the lands to the north are more wealthy, the defensible nature of the southern course is a strategic necessity if they are to avoid conflict with other pretenders until they have dealt with Marverni. Wayland, clearly a weak pretender in need of a friend, bows to Akenbei’s demands without hesitation. The realization of this Accord will take some time yet, as there are numerous lands betwixt Yomi and Marverni that still pretend independence, and the war of faith with Oceania is still ongoing and will require significant investment. But for now, Akenbei is satisfied with his newfound sense of intrigue, and looks eagerly to the future. 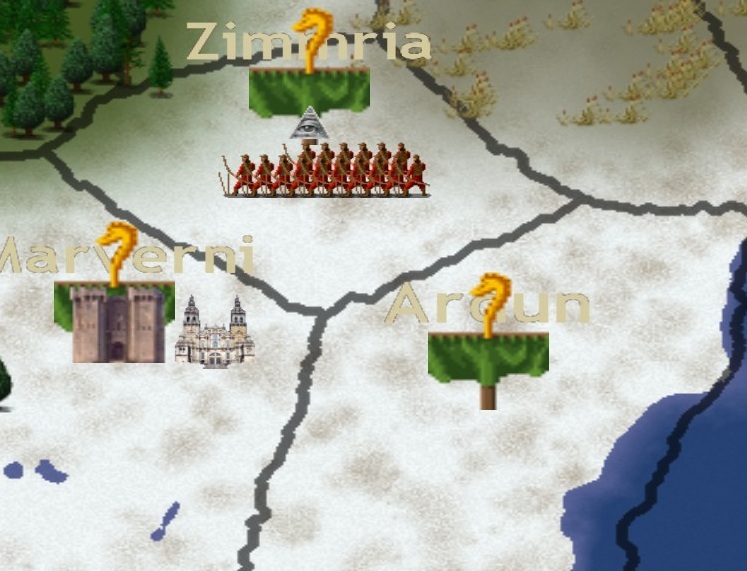 Posted on September 26, 2011, in Game Diary and tagged Dominions 3, RPS. Bookmark the permalink. 2 Comments. May the autumn harvest be plentiful in bone and blood!